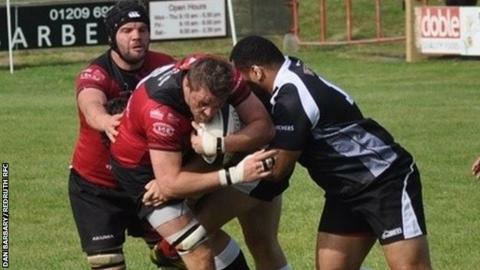 Launceston director of rugby Neil Bayliss says his side's defence was "fantastic" as they beat Canterbury 25-12 in National Two South. The Cornish All Blacks were down to 13 men at one point but held out, despite late pressure from their opponents. "Our defence all afternoon was fantastic and those last 10 minutes certainly tested our character as a squad and as a side," said Bayliss. "I just knew they weren't going to cross the line," he told BBC Cornwall. The victory moves Launceston up to 10th place in the division, leapfrogging Cornish rivals Redruth, who they play later in the month. The win was Launceston's fourth in the league in their last five games and ended a run of five straight defeats. "Full credit to all the guys out there, they put their bodies on the line in defence," said Bayliss. "I'd love to look at the possession because I think we hardly had the ball in the second half, we were defending for such long periods. "That is so tiring on the bodies, it was a fantastic effort from the guys."